Which basically means "Do not want." McLeach: Your bird's dead. Someone shot her; shot her right out of the sky. McLeach: What do you mean, "no?" You calling me a liar? The moment when a character realizes that something awful has happened, or notices that something awful is about to happen, and screams "NOOOOOOOOOOOOOOO!" It can also be used when a character is angrily refusing to do something. If the character is rushing to prevent the something-awful from happening, a slow-motion effect can be employed to draw out the tension of the moment, sometimes to the point of drawing out the "No" into a comical bass growl. This trope is very susceptible to becoming Narm, but does raise the question of exactly how a character should handle a crisis without coming off as a psychotic (by going catatonic), a monster (by cracking a grim joke), or a potty-mouth (by swearing one's head off). Used both seriously and for comic effect. Very common on sitcoms. Sometimes the Big "NO!" ends the episode with a Cliff Hanger. Nearing the point of becoming Narm and a Discredited Trope, though a good actor can still pull it off. Some variants still have credibility, including a shorter but still intense "No", and a panicked "No no no no no!" Or you can just go for the simpler Skyward Scream. Occasionally the character will shout something other than "No! "—usually shouting the name of the character that something bad is about to happen or has just happened to. This is slightly less discredited. Language matters a lot. For example, Big "NO!" is commonly played straight in Japanese media, due to the equivalent iya's higher screamability. But not very common in Russian, due to the equivalent nyet's very low screamability. When a villain screams the Big "NO! ", it's usually as his plans are crashing down around his ears. And also usually the last thing he ever says. Often combined with a Futile Hand Reach. Large Hams will pull one out a Giant "NO!" if given the opportunity. Compare/contrast with Big Yes, Little No, Big "Never!" and Rapid-Fire "No". Has a Sub-Trope cousin, Slow No. See also Death Wail, Big OMG, and Howl of Sorrow. Not to be confused with a certain mecha series with a similar-sounding title. See here for a side-by-side comparison of a LOT of No's. Here's two more with a ton more famous ones. And see here for a hilariously useful Instant-Noooo. The thing that makes this trope so effective is the fact that most people identifying the word "no" with something going wrong. So when we hear a character screaming with a very loud "nooooooooo! ", it really gets to us. People with different psychologies are not as affected by this and may view the scene as comical instead of as the emotional moment it may be intended as. When this shot of a character exclaiming negatively while in slow motion, the scene may be even more dramatic (although this is usually a sign that the character is dying). A closely related trope is Say My Name, which is often substituted for this. All The Tropes Has Already Ruined My Life? 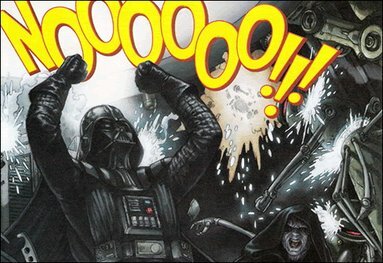 NOOOOOOOOOOOOO!!!!! ↑ It literally means "unpleasant"... but is usually translated "no" when in line with this trope. This page was last edited on 28 March 2016, at 15:32.